Several writer buddies have asked lately if I think in-real-life launch parties are worth it in a virtual age. If you're about to celebrate the publication of your first (or second or third) book, should you throw a book launch party for friends, fans, and family members? I'm a social media geek, but there's still no better way to invite people into your stories than to appear in person. You spread the word about the book through press coverage and social media, creating a ripple effect around each event. You support and encourage the indie booksellers who faithfully support and encourage our books. How many events should you plan? Admittedly, launch parties are a lot of work. Thankfully, publishers and booksellers share the work load, but the ball is in the author's court. I'm fundamentally an introvert, like many writers, and the experience of being in the limelight is draining. That's why I usually aim for only one party per book, but try to schedule a West Coast launch and an East Coast launch—places where I know people. Do you plan the party for young readers or for the adults who usually show up? I cherish the teen and tween young readers who set aside time to come to these events. I know how busy they are. But I also see each launch as a chance to nurture a community of adults who care about those young readers. More and more adults are reading YA books. They want good storytelling imbued with hope, and they're turning to our genre to find it. At my parties, I welcome both the young and the young at soul. I like to tell a couple of interesting stories behind the story so attendees feel privy to an inside scoop. I also invest in some book-appropriate, inexpensive giveaways. For Bamboo People, for example, I gave away bamboo bookmarks I'd picked up in a Thai market. For Monsoon Summer, I bought a bunch of incense sticks from our local Indian grocery and handed those out. Brainstorm ideas for suitable giveaways with a creative buddy, and prepare with a good tale or two about the writing of the book. How can social media help pull everything together? These tools are superb ways to gather a story-hungry circle around the fire. On Facebook, I take the time to sort my friends into geographical lists and target my invites that way, trying to make them as individualized as possible. On Twitter, I find folks in the area outside my writing circles who might be interested in the subject matter of the book and invite them to the party via a personalized tweet. Even if not many people show up, don't be discouraged. Ask someone to take photos so that you can post them on twitter, facebook, pinterest, and your blog if you have one. In fact, that's the key to seeing the event's publicity potential—understanding the multiplication effect of getting the word out about your book, first by invitations and announcements, then via the press and your delightful bookstore host, and lastly through social media's tags and share functions. The bottom line, though, is that a launch party is a celebration of your book. By planning and hosting the event, you underline your pride and joy in this story as you send it out to readers. Bon Voyage, new book! 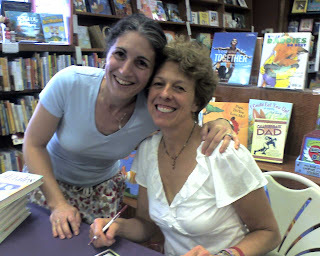 Authors Laya Steinberg (THESAURUS REX) and Karen Day (A MILLION MILES FROM BOSTON) celebrate the publication of Karen's NO CREAM PUFFS at Wellesley Booksmith. Other questions? Ask them below, or share your favorite tips for successful book launch parties.